To Vaiśravaṇa, I bow down. To Dhṛtarāṣṭra, I bow down. To Virūḍhaka, I bow down. To Virūpākṣa, I bow down. Translated from the Tibetan by Erick Tsiknopoulos, September 9th, 2016 in Pokhara, Nepal. Finalized on December 31st 2016 in Boudhanath, Kathmandu, Nepal. “orange” (dmar-gser), literally ‘reddish yellow’. Wow, thank you so much dear vajra brother, this is simply superb. 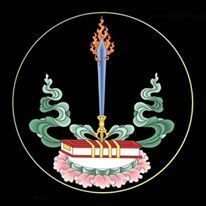 Please extend my thanks to Ngakpa Jamyang La.